Li, Wei, et al. "Design and evaluation of a command recommendation system for software applications." ACM Transactions on Computer-Human Interaction (TOCHI) 18.2 (2011): 6. 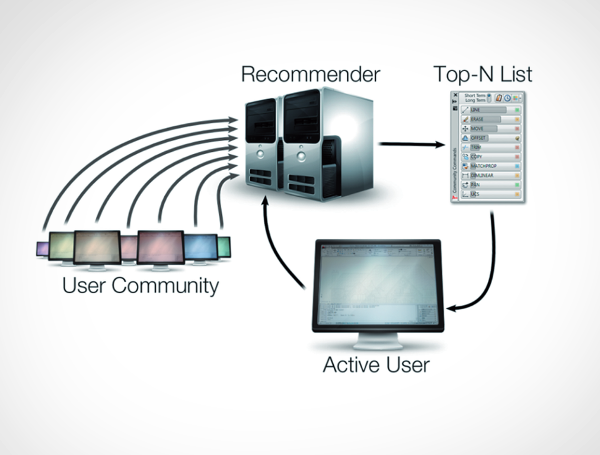 We examine the use of modern recommender system technology to aid command awareness in complex software applications. We first describe our adaptation of traditional recommender system algorithms to meet the unique requirements presented by the domain of software commands. An online evaluation showed that our item-based collaborative filtering algorithm generates 2.1 times as many good suggestions as existing techniques. Motivated by these positive results, we propose a design space framework and its associated algorithms to support both global and contextual recommendations. To evaluate the algorithms, we developed the CommunityCommands plug-in for AutoCAD. This plug-in enabled us to perform a 6-week user study of real-time, within-application command recommendations in actual working environments. We report and visualize command usage behaviors during the study, and discuss how the recommendations affected users behaviors. In particular, we found that the plug-in successfully exposed users to new commands, as unique commands issued significantly increased.